As children we have all dreamed of having super human powers such as “Bishop, Jean Grey (Phoenix Force), Dazzler (respectfully)”. Although we’re still far from casting our own lightning bolts; however, with the development of wireless charging technology we can in a way satisfy a minuet aspect of this dream. In 2018 the Apple iPhone may adopt wireless charging with its possibly new fiberglass shell; however, if such an adoption were to take place it would undoubtedly spar an array of exclusive aftermarket chargers causing confusion and risk of interoperability. Also from our observation of IFA 2016, the majority of future wearable devices would equipped with dust & liquid repellent features. In 2013 Allion published The New Era of Unlimited Battery Charging Technology: Allion Wired & Wireless Charging Test & Evaluation Report, during this comprehensive study we uncovered some concerns regarding the first generation wireless chargers which were: Extended Charging Periods, Low Charge Efficiency & Energy Conversion Rate, Safety and Interoperability Concerns. Three years after our initial study there are now ever more wireless products available on the market; hence, our superior experts decided to conduct an extensive study on the most up to date products now available on the market. For our study we have chosen those with the latest Qi versions and those most capable & presentable: The Ikea NORDMÄRKE (Qi V1.1) followed with the Samsung EP-NG930(Qi V1.2). Our Receiver for this test is the Samsung S7. Our test would involve Wireless Charging Performance, Wireless Charging Efficiency, Qi Devices Interoperability and User experience. Three years ago a team in Allion performed a test on one of the first generation wireless chargers the MaxWell WP-PD10. Its charging capability was around 600mAh(avg) and took around 3 hours to fully charge a 2000mAh battery. Now we’ll be using a 3000mAh battery of Samsung S7 for a rematch. From the table below we can observe that the updated versions of wireless chargers do perform better. Using the Ikea wireless charger as a comparison we found a 63% difference in the charge current and a 5% increase in charging efficiency. 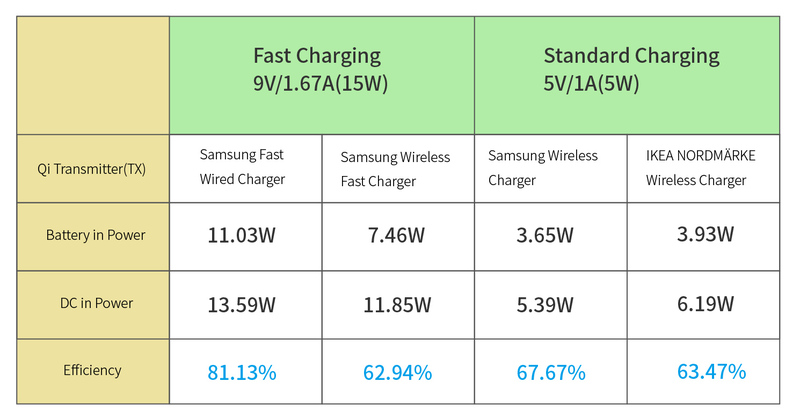 We’ve also made a comparison between Fast Chargers & normal chargers. We found that the Samsung Fast Charge compared with the Ikea wireless charger produces 52% more charge current (1454mAh(avg.)) and an 18% reduction in charging time. It is obvious that Fast Charge can perform better in terms of charging speed, but an increase from 5V to 9V also raises safety concerns. When we compare Samsung’s conventional wired charging process with the wireless we can obviously see that charging with a wire has its advantages, yet the wireless can still be considered as acceptable. To this day there is still no clear set standard in the industry regarding the measurement of efficiency, when we conducted these tests we choose Wireless Power Consortium (WPC) as an evaluation standard, due to the fact that they are at this time the major promoters of this category, they are represented as Qi logo, another notable player would be the AirFuel Alliance; however, we did not refer to them because they do not have much to offer in terms of products in the market. The formula respectfully, excludes power loss from AC adaptors due to the unbalanced quality of adaptors. Thus at this point the efficiency level for charging would be at around 60%. Following the extinctive testing & research of the data, we have found the chargers in question have all exceed 60% efficiency. Yet when compared with conventional chargers, there is still a 20% difference. Thus the issue in question would be improving efficiency in any future prospects. 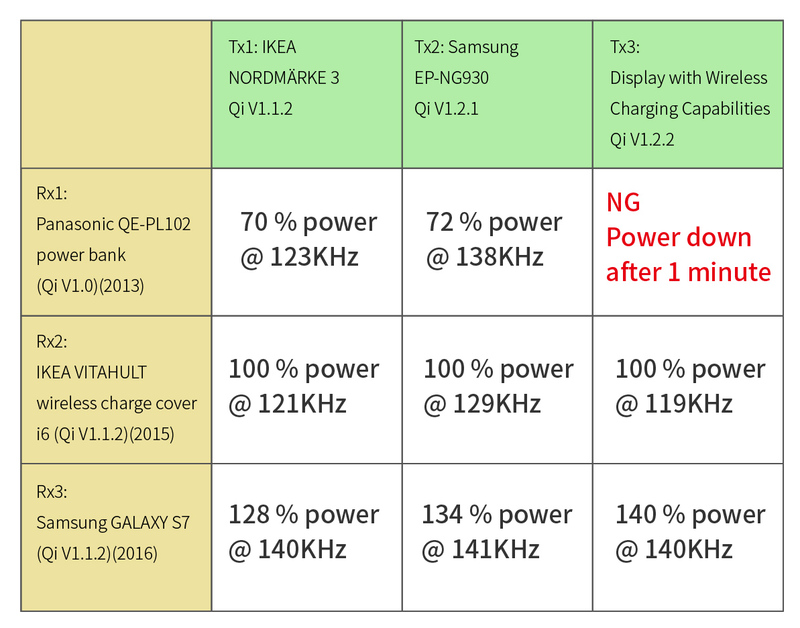 The evolution of wireless charging from Qi V 1.0 to Qi V 1.2 is still plagued by interoperability. WPC in the standard 1.1 Qi has implemented (Foreign Object Detection; FOD). Hence, if the charging platform senses a disturbance caused a foreign object, it would immediately cease any operations. WPC has since updated their standard to Ver. 1.1 and plans to halt sales of all Ver. 1.0 products within a year. When conducting interoperability testing we referred to WPC QI Interoperability Test SPEC Ver. 1.4 for testing. Besides the two test targets we have added a new display with wireless charging capabilities. For the receiving end (Rx) we included a Power bank, wireless charging casing and a smartphone. We have also enlisted a Qi sniffer to aid in our observation. Below in detail are supporting Qi specifications we used in the three (Rx) and a Transmitting (Tx). We have found the new display with wireless charging capabilities (Qi Ver. 1.2.2) had critical design flaws which caused a cession of energy supply after one minute. Although the product had obtained Qi certification, there are still interoperability issues; thus, we speculate there are still a good proportion of products which have passed Qi, but still have underlying issues relating to interoperability. Therefore, these issues should not be eluded by manufactures in the future. We at Allion understand the numerous conditions & environments our readers encounter daily; such as most people may use casing for their smart phones or some may use a RFID card and an (Oyster / Suica / MetroCard). Hence after we place our phones on the charging platform; would it result in interference while charging? Likewise, if coins or keys were placed on the platform; what would happen? Using DLNA(Wi-Fi) to listen or share music. Using DLNA or Air Play to cast images on to the TV. Text / Calls / Line Message / Email, etc. We have also observed in some cases reception quality may decrease. For instance if the user placed coins or keys on the platform, the metallic objects would become heated. It would not be hard to imagine what could come of this. Wireless charging may be a possible trend in the near future, besides phone charging some cars have now been equipped with Qi certified devices on board; thus, safety is now a priority we should look in to, also how to protect the life span of batteries. These and many others are all important aspects developers must look in to in the near future. The need to compare chargers regarding to their charging time, efficiency, temperature, effective range and interoperability has become a challenge for all developers and producers. Also interoperability would affect user experience; hence, sufficient product testing and evaluation is needed prior to product release. This entry was posted in Technical Blogs and tagged Interoperability, User Experence, Wireless Charging.